This 6th week of our 52 week Light project, a collaborative project I am working on with several other talented photographers, continues with our backlight theme. Simply put, backlighting is when a light source is behind the main subject. While some may find it counterintuitive to shoot into the light, the effects can be quite magical. By having the light behind your subject, the finer details of an object can be enhanced. Landscape photography works well with backlighting, especially with sunsets, sunrises, and silhouettes. Rim lighting on people's hair and pets is especially beautiful. Macros also work well with translucent flowers and foliage. Even atmospheric elements such as haze, fog, steam or mist can be intensified and therefore alter the mood of an image. We will be spending four weeks using backlighting in our images, a fairly advanced technique. Below is my second take using this technique. 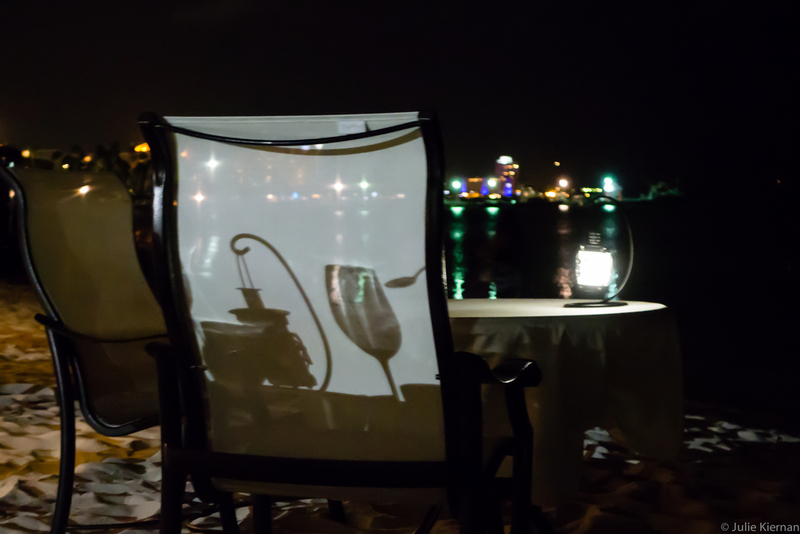 Tom and I were having dinner on the beach at the Marriott in Aruba when I saw this interesting shadow and the city lights behind it. The city lights and candle provide the backlight, but there was also a little artificial light to the left and behind this table. Please continue along our blog circle by clicking HERE to see the talented and stunning work of photographer, Linda Hooper. She is presently living in Switzerland where she captures beautiful images of her children, along with countryside vistas and macro images of nature encountered while hiking or traveling .